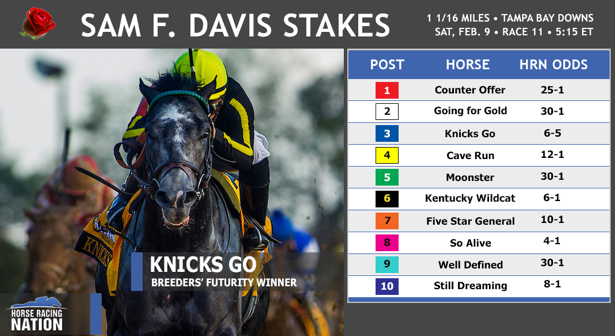 Tampa Bay Downs hosts the first of its two Kentucky Derby 2019 preps on Saturday, with the Sam F. Davis Stakes (G3) marking the season debut of Grade 1 winner and Breeders' Cup Juvenile runner-up Knicks Go. Ahead of post time for the 1 1/16-mile feature in Florida -- that's 5:25 p.m. ET -- we polled Horse Racing Nation contributors for their selections. Please note, picks were submitted before the Saturday morning scratch of Cave Run from the field. Analysis: I don't often pick favorites, but I believe the price on Knicks Go will be right Saturday given how many public handicappers are siding against him. You can find a good horse anywhere, and I believe he's a classier runner than many give him credit. For me, this is as simple as playing win/place assuming the 5-2 morning line holds. Cave Run is surely better than his last effort, and Still Dreaming is promising as a hard-trying runner. Analysis: While Knicks Go seemed to bounce in his first start after the Breeders' Cup Juvenile, I think he is still the one to beat here. He has the highest speed figure of any in this field. However, this field is very well put together and is going to be an interesting race. Graham Motion is sending a 1/2 sibling to Nyquist here to make his third start. I think he could do well here. Analysis: TimeformUS Pace Projector thinks the pace will go fast, harming Knicks Go's chances. Kentucky Wildcat will settle around midpack, away from the heat and in front of the closers. If Kentucky Wildcat runs his usual TimeformUS Speed Figure around 105 to 115, he can win against this questionable field.